This specification defines the performance of rechargeable LiFePO4 battery pack TB38450F-T112A manufactured by SHENZHEN TOPBAND BATTERY CO.,LTD, describes the type, performance, technical characteristics, warning and caution of the battery pack. This system Include 4 pack modules, 1 control module, and 1 standard 19”cabinet. Unless otherwise specified, all performance tests is required conducted at temperature 25℃±2℃, Humidity less than 45%~75%RH. Unless otherwise specified, the tested product is required unused within one month after outgoing. 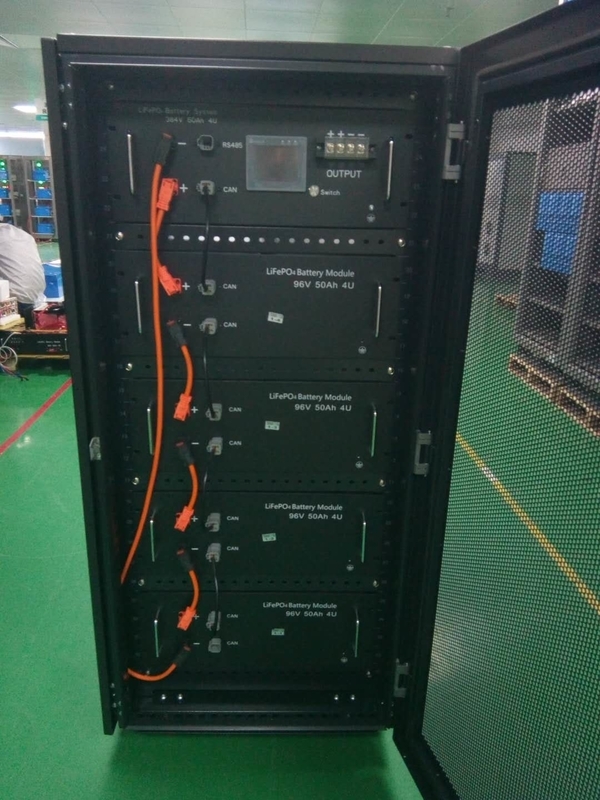 The Battery Management System (BMS) can monitor and optimize every single prismatic cell during charge & discharge, to protect the battery pack overcharge, over discharge, short circuit. Overall, the BMS helps to ensure safe and accurate running. 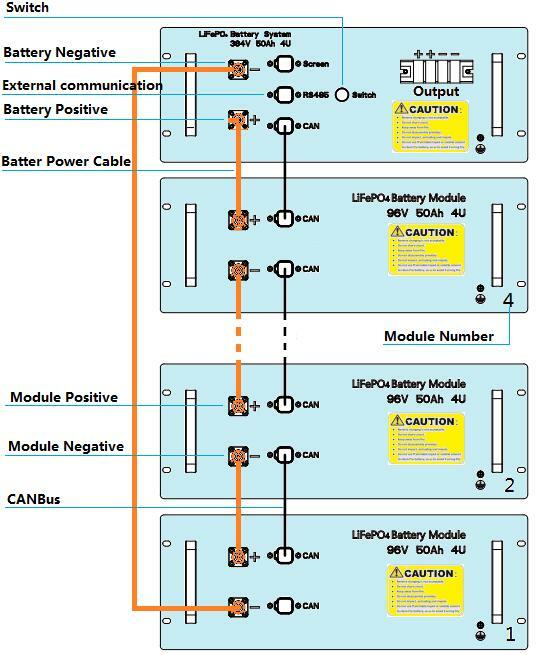 ² Based on the character of cell, proper environment for transportation of LiFePO4 battery pack need to be created to protect the battery. ² Battery should stay in the warehouse 15℃～35℃ where it’s dry, clean, shade, and well-ventilated. ² The battery should be stored in 50% SOC during transportation. ² Keep the battery against dropping, turning over and serious stacking during loading. ² Ensure the single 96V50Ah battery module in the independent package and keep it face up. 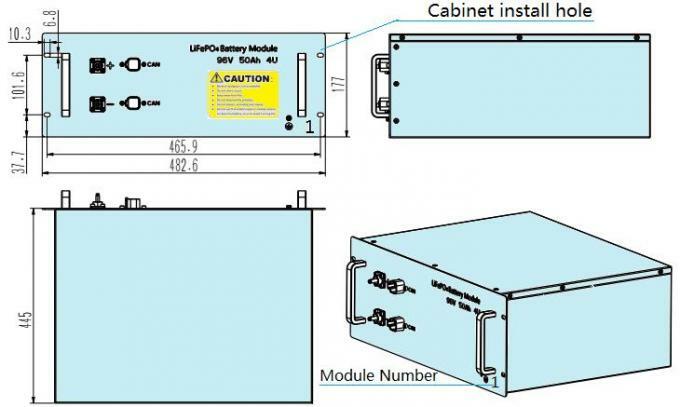 Step1: Install single battery module to a standard 19” cabinet through 4 pcs M6 screws. Note:Fix the battery module according to the module serial number. Install 1st module in the bottom, and the control module in the top. 5th: Press on switch, and then can start the system output. Note:When user needs to stop output and disconnect the system,reverse the above operation order. ² Please read and follow the specification and caution remarks on battery surface before use the battery. Improper use may cause heat, fire, rupture, damage or capacity deterioration of the battery. SHENZHEN TOPBAND BATTERY CO.,LTD. Describes is not responsible for any accidents caused by the usage without following our specification. ² The battery must be far away from heat source, high voltage, and avoid to be exposed in sunshine for a long time. ² Do not use the battery mixed with other different manufacturers, type, or model batteries. 7.1 Do not surpass the largest charging current that the specification stipulated. 7.2 Do not surpass the highest limited voltage that the specification stipulated. 7.3 Charging temperature:within temperature scope that specification stipulated. Short time doesn't affect the use of the battery overcharge too, but for a long period of time over discharge or over charge can affect the function of the battery failure, or the battery can't use permanent, appear serious safety hazards, need a long time floating please use the recommended floating model specification.